From Goodreads: Eight years after Graceling, Bitterblue is now queen of Monsea. But the influence of her father, a violent psychopath with mind-altering abilities, lives on. Her advisors, who have run things since Leck died, believe in a forward-thinking plan: Pardon all who committed terrible acts under Leck’s reign, and forget anything bad ever happened. But when Bitterblue begins sneaking outside the castle—disguised and alone—to walk the streets of her own city, she starts realizing that the kingdom has been under the thirty-five-year spell of a madman, and the only way to move forward is to revisit the past. Two thieves, who only steal what has already been stolen, change her life forever. They hold a key to the truth of Leck’s reign. And one of them, with an extreme skill called a Grace that he hasn’t yet identified, holds a key to her heart. I made no secret of my love for Kristin Cashore’s Graceling a few months ago. I never thought I’d say this, but I loved Bitterblue even more. This book… It wrecked me in every way possible. It made me laugh, it made me swoon, it made me angry, it broke my heart and, at times, it absolutely horrified me. I can’t stop thinking about Bitterblue, even now, nearly a week after reading the last page. 1. I found Bitterblue to be an utterly endearing protagonist. She’s easier to like than Graceling‘s sometimes abrasive Katsa (who I personally have nothing against), and her inner monologues are charming in their openness and honesty. She makes plenty of mistakes, is often naive and occasionally brusque , but she tries with everything in her to be the queen her people need. The opposition (both external and internal) Bitterblue faces over the course of this novel is monumental–often soul-crushing–and while she reacts appropriately and relateably, she never gives in to the chaos and turmoil that’s thrown at her from every direction. Her determination and absolute loyalty to her kingdom and her friends make her an easy character to root for. 2. The world Kristin Cashore has created within the pages of her Seven Kingdoms books is so thoroughly developed, with such careful attention to detail, it almost feels real. I was completely immersed in the Monsea’s traditional clothing, food, customs, distinct patterns of speech, and expressions (incidentally, can we PLEASE make “Balls!” happen?). From Bitterblue’s lavish rooms, to Leck’s creepy castle artwork, to the seedy streets of Bitterblue City, this story’s world grabbed me and never let go. 3. Bitterblue is a visit with old friends. Katsa, Po, Raffin, Bann, Giddon, and Helda (among others) appear within its pages, which makes it an easy story for this Graceling fan to fall into. Everyone is eight years older, and it’s all kinds of fun to swoon over men in what is technically a YA story. And speaking of men… My love for Prince Po runs deep, but Bitterblue let me in on a whole new side of Lord Giddon. I’ve always favored the literary strong, silent type, and Giddon is those things and beyond. The gentle, caring way he interacts with Bitterblue is lovely, and I’m not-so-secretly hoping for a follow-up novel that offers more of his story. So, Bitterblue. I can’t say enough about this novel. In my humble opinion, it was just about as perfect as a story can get. If you haven’t read it, please, please, PLEASE pick it up soon. It’s most definitely going on my short list of favorites. Friends, have you read Bitterblue? Did you love it as much as I did? Wow! Wonderful review, Katy and that books sound simply AMAZING! I haven´t read GRACELING yet, would you advise to read the books in order to get the same “nice seeing you” again feeling? It´s definitely moving up my TBR now 😀 Thanks for sharing! Graceling is STILL a gap book for me, and I plan to fix that SOON. Awesome review! Please do read it ASAP, Alison. I hope you love GRACELING and BITTERBLUE as much as I do! Yep. Exactly. And DITTO on the High Court scene. When it first started to go down, I think I audibly sucked in my breath in anticipation. I did too, Meredith! My eyes were huge and my heart was pounding… It’s so rare that I have a physical reaction to a book, but this one (and this scene, particularly) completely blew me away! 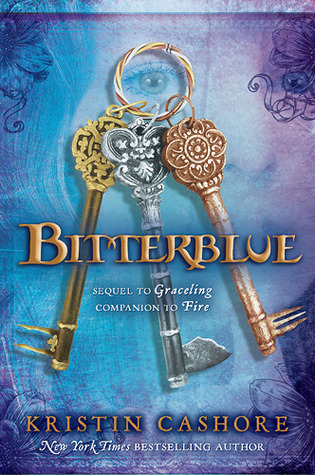 Graceling, now Bitterblue are on my TBR list. Geez, they’re never ending. They keep populating on my TBR list like bunnies. 🙂 Thanks for the awesome review! I hope you’re able to read them soon, Jenny. They are fantastic stories, and beautifully written! Yep, so, so awesome. As I mentioned to Meredith, it’s so rare for me to react physically to a book, but BITTERBLUE had me gasping and grinning and nearly gave me a heart attack more than once. I loved it so much! I loved Bitterblue even more than Graceling, too. I thought the subplots were more developed and loved all the political intrigue. Okay, your comment about the High Court scene makes me want to read this more than all the other points. Court scenes are the best part of fantasy, and I want to be in on it. Fortunately, I liked Graceling, so I don’t mind adding yet another book to my TBR list. Yes, now I want you to read it right away, Sophia, so I can know if you loved High Court as much as I did. Such a brilliant scene!